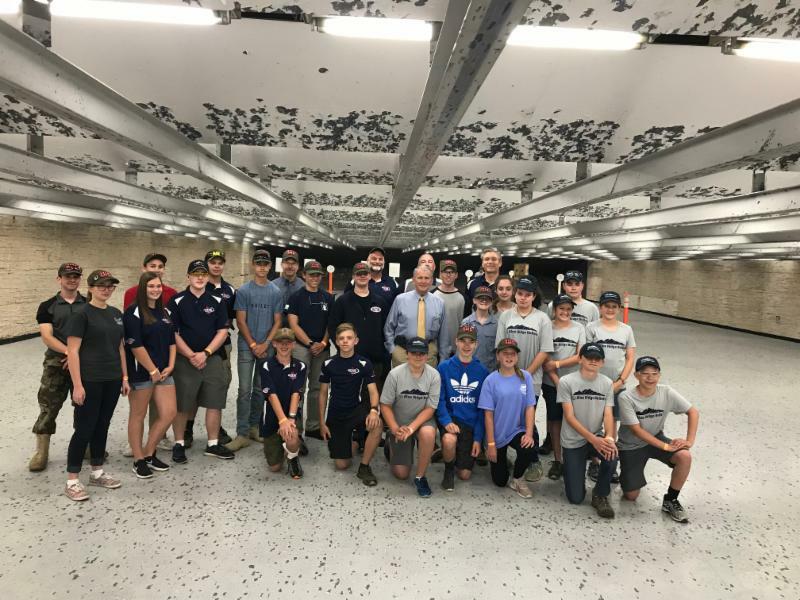 (Cedarburg, WI) – The Commonwealth of Virginia held its first SASP State Match on June 26th. The match was hosted by the NRA Headquarters Range and attended by the two Virginia teams as well as a team from North Carolina. In addition to the match, attendees were able to sample the fantastic cuisine at the NRA Headquarters Cafeteria, receive guided tours of the National Firearms Museum and even shop at the NRA Gift Shop with a special SASP discount. A highlight for many in attendance was the opportunity to meet the newly elected NRA President Oliver North who stopped by to wish the 23 competitors well and welcome all to the NRA. In rimfire pistol, the Gaston Young Guns from Gaston County, NC took first place eking out the win by just 0.61 seconds but nonetheless an impressive accomplishment for a team that primarily shoots rifle. Team LoCo Motion of Purcellville took second place with the Winchester Izaak Walton League Blue Ridge Bullets coming in 3rd. At the individual level, Adam Jardines of Team LoCo Motion took first place with Dalton Bridges and Gavin Rainey of Gaston Young Guns taking 2nd and 3rd respectively in the Senior Division. Ethan Jardines of Team LoCo Motion took 1st place in the Intermediate Division followed by Alex Kolosowsky of Gaston Young Guns in 2nd and Maccoy Gilkison of WIWL Blue Ridge Bullets taking 3rd. Due to time constraints, mini matches were held for both rifle optics and iron sights. The teams would like to thank Kelvin Walton the SASP Director of Development for his assistance with the match. Are you or your company interested in being part of or supporting the largest competitive youth shooting program in the world? Then contact Rick Leach, SASP National Director at rleach@sssfonline.com or check out our 2018 Media Guide at: sssfonline.org/about-sssf/advertise-us. For more information about SSSF, visit www.sssfonline.org.